I recently ordered a bowl of French Onion Soup at a favorite local pub that for years has been known for theirs. What I got was a thick layer of melted cheese on a slice of bread that had soaked up most of the weak broth underneath with a scant serving of onions. 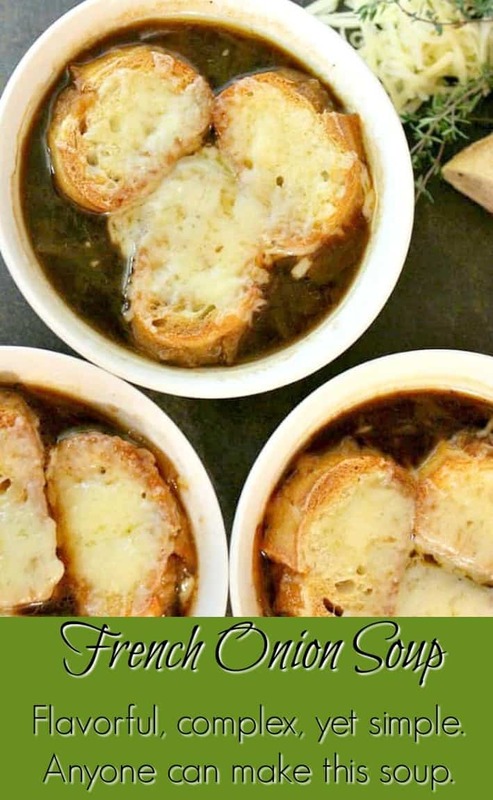 Maybe it was just a bad night, but I was left wanting… and this experience sent me on a mission: Find the best French onion soup recipe that I can make at home. After some trial, error, and disappointment, success is mine. And now it’s yours too. This recipe comes from America’s Test Kitchen and I should have just gone there first. They do all the research; testing several types of onions as well as coming up with the best cooking methods. I mean, they are the TEST kitchen. 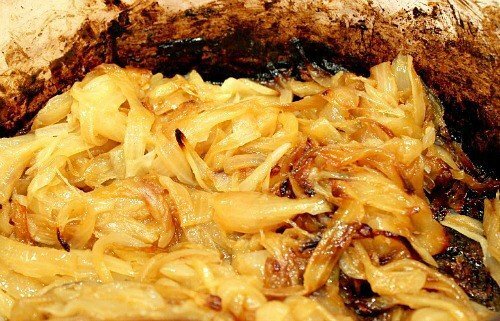 The success of this recipe is based on creating a deep, crusty caramelization with the onions, also known as fond. After following this recipe (courtesy of Christopher Kimball’s house guest from France), let me tell you how fond I am of onion-fond! (You knew I had to go there.) The recipe requires a bit of pre-planning but it’s extremely easy. You do need to start early, and monitor it periodically until the active hands-on portion during step three of the printable recipe. Start with about six large yellow onions, sliced pole to pole. See note below on crying over your onions. Do not use sweet, white or red onions. They each have less than stellar results. So, nice round yellow onions it is for this recipe. After the onions are sliced (not too thinly), spray a heavy bottomed pot (at least a 7 quart size) with cooking spray (cast iron is what I use), place butter in the bottom and fill it with your onions. You will add a bit of salt here to help sweat the onions. Cover and cook in a 400 degree oven for an hour. Your house will start to smell amazing right about now. Here they are after the first hour in the oven. Those onions that totally filled your pot have started to sweat down and are beginning to caramelize to the sides of the pan. Give them a good stir, crack the lid about an inch, and put them back in for another 1 1/2 to 1 3/4 hours, stirring again after one hour. Now there is a heavy crust (the fond I mentioned earlier) that is starting to form and your onions are totally reduced. At this point, you’re going to cook them on the stove top, to draw out more of the moisture and deglaze the fond from the pan. You will add water and deglaze at least three times as the onions continue to brown. The crust is THE flavor that makes this French onion soup recipe stand out. The deglazing portion was really the only active part of this recipe. 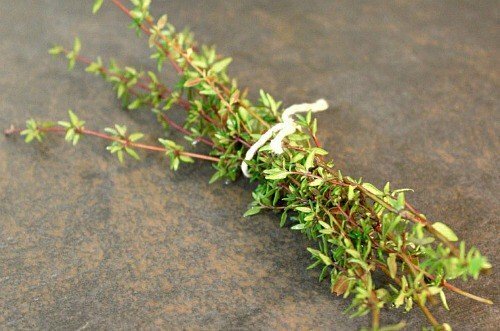 Now you need a little bouquet of thyme sprigs and a bay leaf. Add this with your cooking sherry, chicken broth*, beef broth (just a bit) and water. Simmer on the stove top for 30 minutes. Finish off under the broiler with toasted, sliced baguette and shredded Gruyère. This soup is super hearty and flavorful. My quest is complete. I hope you agree. *Note: I’ve had people ask me why not just use beef broth here, assuming the beef broth will give deeper flavor. But that is not the case. This is French ONION Soup. Using chicken broth allows for the onions to shine in this soup. Trust me, the soup will have the perfect depth of hearty flavor. This is authentic "French" onion soup. It is not difficult to make and the hands on process is only toward the end of the recipe. 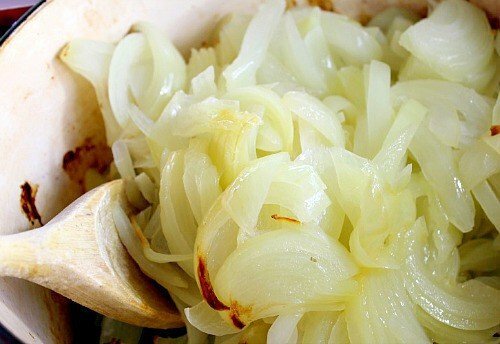 The onions do require a lot of time in the oven to caramelize. But it is well worth it. Adjust oven rack to lower middle position and heat oven to 400 degrees. Generously spray inside of heavy-bottomed large (at least 5-quart) Dutch oven with nonstick cooking spray. Place butter in pot and add onions and 1 teaspoon salt. Cook, covered, 1 hour (onions will be moist and slightly reduced in volume). Remove pot from oven and stir onions, scraping bottom and sides of pot. Return pot to oven with lid slightly ajar and continue to cook until onions are very soft and golden brown, 1 1/2 to 1 3/4 hours longer, stirring onions and scraping bottom and sides of pot after 1 hour. Note: I usually use my 7-quart Dutch oven, but when I use my 5-quart, which is the more common size, I only cook for the additional 1 1/2 hour in the oven. The smaller pot browns the onions very deeply during this time and it happens faster. Carefully remove pot from oven and place over medium-high heat. Using oven mitts to handle pot, cook onions, stirring frequently and scraping bottom and sides of pot, until liquid evaporates and onions brown, 15 to 20 minutes, reducing heat to medium if onions are browning too quickly. Continue to cook, stirring frequently, until pot bottom is coated with dark crust, 6 to 8 minutes, adjusting heat as necessary. (Scrape any fond that collects on spoon back into onions.) Stir in 1/4 cup water, scraping pot bottom to loosen crust, and cook until water evaporates and pot bottom has formed another dark crust, 6 to 8 minutes. Repeat process of deglazing 2 or 3 more times, until onions are very dark brown. Stir in sherry and cook, stirring frequently, until sherry evaporates, about 5 minutes. Stir in broths, 2 cups water, thyme, bay leaf, and 1/2 teaspoon salt, scraping up any final bits of browned crust on bottom and sides of pot. Increase heat to high and barely bring to boil. Reduce heat to low, cover, and simmer 30 minutes. Remove and discard herbs, then season with salt and pepper. While soup simmers, arrange baguette slices in single layer on baking sheet and bake in 400-degree oven until bread is dry, crisp, and golden at edges, about 10 minutes. Set aside. Adjust oven rack 6 inches from broiler element and heat broiler. Set individual broiler-safe crocks on baking sheet and fill each with about 1 3/4 cups soup. Top each bowl with 1 or 2 baguette slices (do not overlap slices) and sprinkle evenly with Gruyère. Broil until cheese is melted and bubbly around edges, 3 to 5 minutes. Let cool 5 minutes before serving. Making this again today. I made it a year ago. It is a wonderful French Onion Soup. The only thing I do different is I don’t put my soup bowls with the croutons under the broiler. I am afraid someone will try to touch the sides of the hot bowl. So I place the croutons on a baking sheet, sprinkle the cheese on top of the croutons and put the baking sheet under the broiler. When the cheese has melting I top the soup with them . You mention using “mostly” chicken broth and add “barely” beef broth yet recipe calls for equal parts chicken and beef. Hi RaeAnn, the recipe of half and half is correct. I meant that using chicken broth at all is a good move. I’ve edited that statement to alleviate confusion. Thanks for the heads up. A suggestion for chopping onions I’ve been using for years without fail. Place the choping board on your cook top under the extractor fan with the fan on full and chip away. I guarantee no tears ever again. Hi Sally! This recipe is amazing and I’m planning on making a ton of it for a mother’s day bash. I need to make about 16-18 servings, but I only have two cast iron dutch ovens to try and pull it off. Do you suggest I do this think in batches, or do you think I could increase the recipe to get all the servings in those two pots? There is an ingredient listed as “soup”. I don’t understand what that’s supposed to be. Hi Aly, that’s not an ingredient. It’s a heading in bold, showing everything below it is for the soup. Then you’ll see a bolded item for Cheesy Croutons and those ingredients are used in making the croutons. Hi Janice, Even though I sent you an email direct when my admin site was down, I’ll also reply here in case anyone else has the same issue. First of all, make sure to cook on the second lowest level in your oven. I don’t know if you did that but it makes a difference. I know you don’t want me to tell you to get another pan, but I’ve only made this recipe (many many times) with a cast iron, heavy dutch oven pot. The non-stick pan you used may prevent a proper fond from forming. Sorry if this isn’t the answer you wanted but I’m glad you liked the recipe anyway. This was indeed very very good! Thank you! Thank you very much for the quick reply (I didn’t see it until tonight) and the excellent soup! I just made it and am eating it now. I was going to give some to friends, but after tasting it, I think I’ll just make them a separate batch!! My only question is: What is a frond??? Thanks! This sounds like the BEST! But, I don’t get what you do with the croutons, did I miss something? I understand the baguette slices, where do croutons come in here? Leslie, the croutons can be served however you like. My pictures show them sitting on the soup but you can also serve them on the side for dunking. This is the ULTIMATE French Onion Soup. I have made it several times and it’s perfect each and every time. Thanks for a great “keeper” recipe! This is my go to French Onion Soup recipe. I’ve made it numerous times and it never disappoints. I just made this today. It was delicious. I follow the recipe as written. This is a keeper. My friend’s daughter is having a bridal shower and one of the things they have asked for is for us to bring one of our favorite recipes and I am happy to share this one with her. I have never tasted a recipe as wonderful as this one! I loved this soup. I have never attempted anything like this so I followed the instructions exactly. My husband even liked it and that’s a plus. 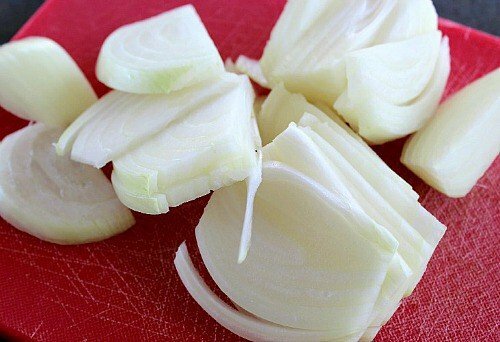 There is the easiest remedy for crying over sliced onions! All you have to do is put your onions in the freezer, with skins on, for about 20 minutes before you slice them. This prevents the onion ‘fumes’ from rising up into your eyes! I read this many years ago, and have no problems, as long as I remember to put the onions in the freezer ahead of time. Thank you Claudia! I’ve heard of this method and keep meaning to try it but then forget to get my onions in the freezer in time. Good tip. I’ve make F.O. soup with a brown ale-works well. Our local pub uses a hardy dark rye with the cheese topping. Lynne, wow a brown dark rye ale sounds very interesting. I must try it. Thanks for sharing. I have always wanted to make this soup and tried your recipe today from an email from Yummly. My husband and I LOVVVVVED IT!!! It turned out perfect the way you described – I did not have a cast iron skillet but used another old heavy duty pan for the oven and the onions were perfect but then again I added a little olive oil to the butter when first in the pan before the oven. Absolutely AWESOME!!! Will make it over and over!! Thank you! D’Evereaux, Thanks for your comment and I’m so glad you both loved it. I’m glad it worked for you in the pot you used and adding a touch of olive oil is a good idea. Thanks again! 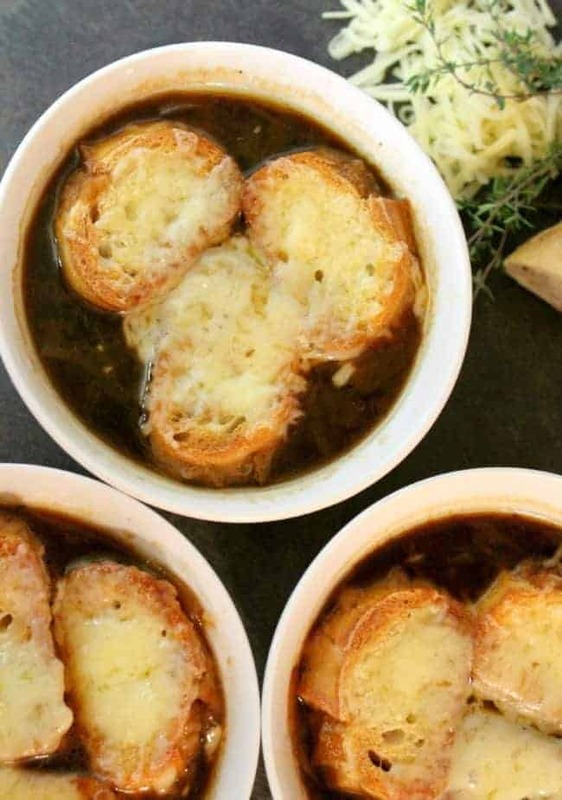 I’ve been looking for a go-to healthy french onion soup recipe and this is it. This soup is delicious with or without the cheese and bread, making it GAPS friendly!!! (Note: I used all beef broth (no chicken broth) and substituted cabernet wine for the sherry (it was all I had on hand). Dawn, Thanks so much for your comments! They will help other visitors for sure. We too love it with no bread or cheese and I’ve made it several times with only beef broth, depending on what I have. Thanks again and have a great week. I made this Onion Soup To Die For! We loved it! However, I did not put thyme in it as I didn’t have any. The Onion Soup was the best we’ve had. We had a bit left over and it was just as good if not better in taste! Thanks for this delicious recipe! Judith, I’m so glad you all liked it! We feel the same way. I think it’s definitely fine without the thyme or you could even add just a 1/2 teaspoon of dried. I think less is better with the thyme anyway. Thanks for commenting. Can this be made ahead of holiday meal and froze? Hi Don, I’ve made it a few days ahead and refrigerated it but I’m not sure how well the onions will hold up if you freeze it. Sorry I’m not more helpful here, but the best I can recommend from experience is to keep it in the refrigerator a few days before serving. I was wondering what are crocks and what size are they that you use?Your recipe sound wonderful.My BF loves french onion soup but I have been intimated to try making it.I really want to try making it.When you make it ,do you make it as a main dish.If so or even if not,what do you serve with it,if anything.Thank you for the wonderful sounding and I’m sure tasting recipe. I tried making this today, but my onions burned. They looked good after the first hour. But thirty minutes into the second hour, I checked on them and they were almost all totally black. I used a Le Creuset pot which I thought would’ve been perfect. Anyway, I think I will try this recipe again, but I will have to make some adjustments for cooking the onions. I’ll let you know how it goes the second time around. Hi Aubrey, I agree, your pot is perfect for this recipe. The onions do get very dark but if yours were totally burnt, maybe your oven runs hotter? You could lower the oven temp by 25F degrees, or raise the rack in the oven up one spot. Thanks for your willingness to try it again. I love this recipe! I’ve made it several times and it’s amazing. I will be making it again as a tasting course at easter dinner. Have you ever made it in advance and frozen it? I’d like to prepare as much as I can in advance, so day of, I’m not overwhelmed. Does it freeze well or how far in advance is it safe to make and keep in the fridge? Hi Elizabeth! First of all, I’m so glad you love the recipe (so do we!). I have made it up to 2 days ahead and just refrigerated it. I’m not sure how the onions would do in the freezer. Happy Easter to you and yours and thanks for making this recipe a part of your celebration. I’m humbled and honored. I am wondering if those that ended up with burnt onions used margarine or a poor quality butter. Anything that has water added to it may cause burning as it evaporates as it cooks, leaving less fat and liquid than may be needed. Just a thought. You can rarely go wrong with a recipe from America’s Test Kitchen. So I’m dying to try this, but don’t haVe a dutch oVen. Any recommendations or any other type oF pan that may work? I made this recipe today. 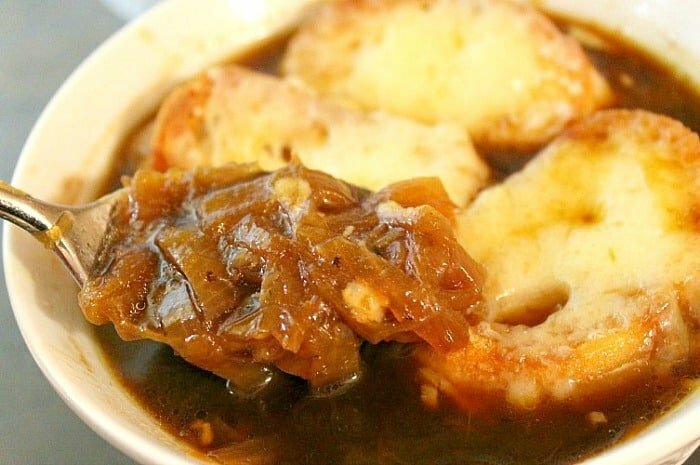 I love French onion soup but have never attempted to make it myself. I never think about it until it is too late. Knowing we have snow on the way in these freezing temperatures I decided to make soup. This was my first and last French onion soup recipe. Rarely do I get a recipe that I love the first time I make it. This was perfect. Everyone (even my daughter who doesn’t care for onions) loved it. I have leftover for my honey to bring to work. I used pre-made crostini’s from The Fresh Market and nice aged Gruyere cheese. Perfect! Thank you for sharing this recipe! Cari, I’m so glad the pictures helped you! Thank you for taking the time to comment, you made my day. I’ve made this recipe twice in the last month, and it is incredible. While it takes some work, the results are delicious and impossible to beat. I followed your instructions exactly, and the pictures were so helpful during some of the scary steps where the onions get dark and look not quite edible. Thank you so much for sharing. Kristin, I am honored that you’ve made this TWICE in a month. Thanks so much for your kind words and I’m glad the photos help because I agree, when you first see the nearly black onions, it’s hard to imagine this is exactly what you want at this point in the recipe. Thanks again for taking the time to comment. Do you have a favorite dry sherry for this recipe? Hi CeeCee, Honestly, I buy whatever is on sale and have never been disappointed. So, just shop within your price range and it should work great. Thanks for stopping by! Hi Kayla, I have always made this with a cast iron pot. I know others have used other types of pans, but as long as it’s a heavy-bottom pot, it should absolutely work fine. I have made this soup dozens of times with never a problem so I appreciate that you say you’ll try it again and I’m sorry to hear it didn’t work out for you. Try with a heavy bottomed pan next time and let me know how it turns out. Thanks for commenting. I think I like my recipe better. I slowly Carmelise my onions on the stovetop. I use a large heavy bottomed stockpot. I add a small amount of butter and olive oil to the pan, fill it completely with thinly sliced onions (8 or 9 large onions) and slowly cook them for about 2 hours with a small amount of sea salt. This sounds like a big hassle but while it’s cooking I get a chance to do some other things around my house and it’s worth the time because of the depth of flavor. You only need to stir it about every 15 to 20 minutes. Remember you need to cook this over very low heat. When the onions are a deep rich caramel color I deglaze the pan with about a cup of a dry red wine add thyme and a bay leaf and allow the alcohol to cook off. Here’s where my recipe changes. I don’t use chicken stock. I add about 10 cups of beef stock and let it simmer a while longer. Friends that don’t like onions request this soup all the time and swear it’s the best soup they ever had. I live in Minnesota and right now the wind chill outside is about 20 below. Luckily I have everything in my kitchen to make this soup. I know what I’ll be doing this afternoon. I made this yesterday didn’t have a Dutch oven so I used a basic stock pot was worried that the pot was too thin, but nope it worked fine and OMG was it ever delicious there will never be another recipe I will use again for this soup. Doing another batch today so I can freeze ahead for some cold winters nights when I work too many hours in the day. Wow Nadine, that is good to know and will be helpful for others who might not have a heavy pot. I make this regularly and I’m so glad you liked it. Thanks for posting! Are most cooktop pots safe to use in the oven? All of my pans are fairly old so have no directions left for them. Norma, for a cooktop pot to be oven safe, the handles cannot be plastic and for this recipe, the bottom should be thick/heavy. A cast iron or ceramic coated pan is ideal. Don’t know if this helps, but not all pans are dual purpose. I made this today and did it ever satisfy my craving! There’s such depth in the flavors! I only had red wine on hand so I used that instead of sherry. I had to put the oven rack really low to fit my pot in the oven so I think the onions may have got a little burnt. I added some honey to the soup and it cut the bitter favour. I would definitely make this again! Andrea, Thanks for commenting and I’m glad you liked the soup. I think I’m going to lower the temp on the recipe here because you aren’t the first person to mention the onions got a little overcooked. Thanks for your input and I like the idea of the wine substitution when necessary and the honey is a great tough. Thanks again. 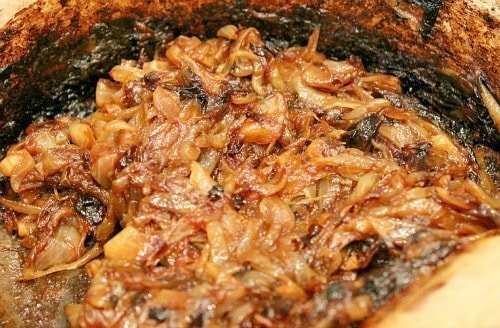 I tried this in a cast iron dutch oven and the onions were burnt black after the first hour. Wondering what I did wrong? Arden, I have never had this happen and I make this soup in a cast iron dutch oven as well. My oven is spot-on for reaching the indicated temperature. I’m wondering if your oven runs hot. Even then, it should not make them “burnt black” after only an hour. Do you know if the onions seemed very fresh? I hope you’ll give it a try again and have better luck. I love this recipe! I make it all the time. I double the recipe and freeze it in a few batches for my husband and I. It is just as good reheated. Sara, I love that idea! I’m going to double this the next time I make it for freezing. Thanks for your comment. How brown is the pot suppose to look on the second baking time? Mine smelled burnt and was pretty dark. I through it away. Darn. Will try again next weekend. As you can see in my photos, my pan got pretty dark. They didn’t smell burnt but were quite dark. That dark “stuff” on the pan is pure flavor. I hope it turns out for you next time! I made this for the second time, it turned out beautifully. The bottom of my pan got quite dark and brown this time, it made the soup taste even better. I was worried that I burned it but that was not the case, it was pure flavor. The other thing I learned was that it must be made with a wooden spoon. The silicon spoon just doesn’t have enough strength to scrape up all the good bits. This recipe is absolutely delicious. Instead of broiling the cheese in the oven, I made the croutons in the oven, and broiled the cheese on the crouton. A few minutes in the soup made them soft and gooey. Thanks Reb! Glad you liked it and I’ve modified the instructions to “barely bring to boil”, rather than bring to simmer. 🙂 Thanks again for your input. Have made it several times. Nothing even comes close. It’s the very best!